Gmail Offline is a great tool just for users that go without internet but still require ready access to old email… or is it? 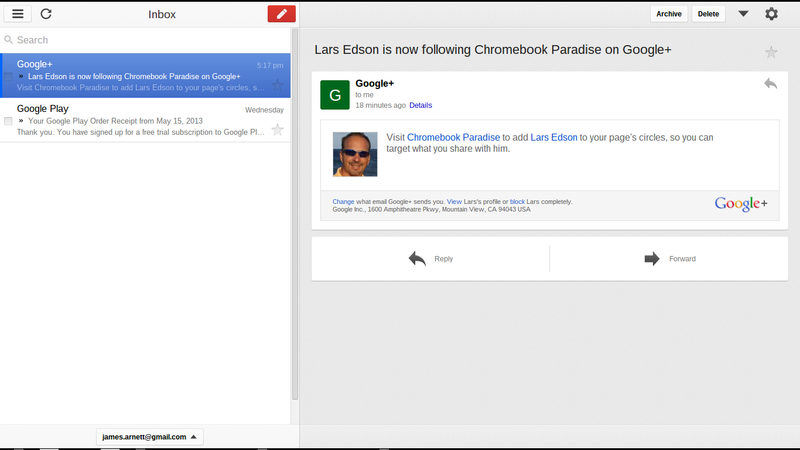 I have been using Gmail Offline, that comes with all Chromebooks out of the box, for about a week now. It is the blue Gmail icon in the apps tray. At first I really did not like using it because I felt like I was losing all of the great features that the Gmail WebApp has to offer. That has truly not been the case. I have come to find that Gmail Offline is great. It uses less processing power and less ram then the traditional Gmail and seems to work faster then the traditional Gmail does. The interface to loads very quickly as it is a loaded app that holds its data on the machine itself. The traditional Gmail is a Webapp that has to load its user interface from the web every time you open and close it, which if you are running a 3G hotspot can take some time. The offline functionality- I know it sounds redundant but this really has gotten me out a few binds where I needed an email now and I didn’t have time to stop and pull out my phone and hotspot it. While these 3 simple things might not seem like much separate, they are great combined into one easy to use, aesthetically pleasing interface, that thick or thin gets the job done simply and quickly. As always if you have any questions make sure to let us know in the comments sections down below. Make sure to hit those like and follow buttons on you way out. This entry was posted in ARM Chromebook, Chromebook, Google Services and tagged Chrome Web Store, chromebook, Gmail, Gmail Offline, google, Google Chrome, Online and offline, User interface by James Arnett. Bookmark the permalink.